Created by the Berlin-based street artist MTO, a graffiti artwork was painted on a Parisian wall a few years ago and only on display for a few days before being painted over. A few photographs of the image, taken by MTO at the scene, are all that remain of the work. 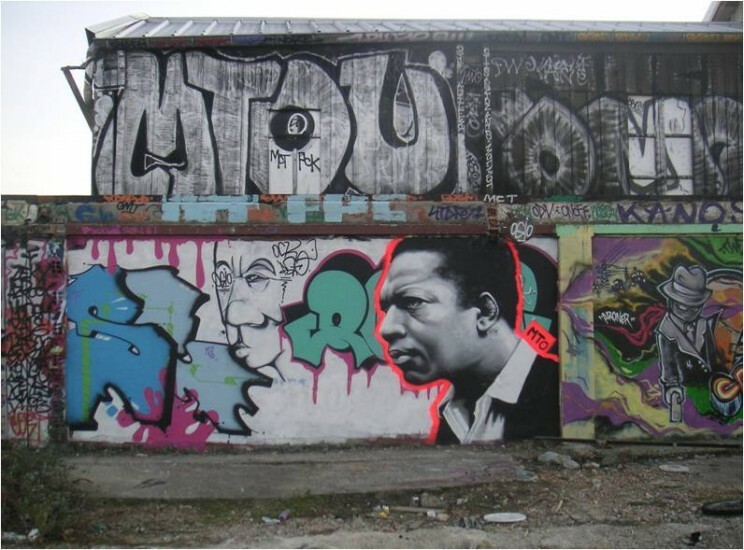 MTO’s image served as a perfect visual manifestation of the issues and strategies at play in my research: a graffiti version of an iconic photograph of John Coltrane which appears on the front of his 1964 album, A Love Supreme. MTO, John Coltrane, 2009. Courtesy of the author. The influence of recordings is more than just musical or sonic in nature; recordings impact different arts and appear in different cultural contexts. In many ways, they have the potential to alter our view of the places we live in and, in some instances, can change our relationship to history itself. The temporary nature of MTO’s artwork and its subsequent use in photographic form and on the web also mirrors the changes that occur when music is recorded, disseminated, and used in different ways. Just as the recordings themselves can be understood in a number of different ways, these layers of mediation — that is, the channels through which we communicate, or the involvement of third parties in the construction and distribution of meaning — enable A Love Supreme (and other recordings) to take on infinite new lives and meanings. MTO’s image is inspired by Coltrane but also acts as an alternative to everyday representations of the icon. This is not an official reading of Coltrane’s masterpiece and, arguably, it conveys a certain politics: the graffiti artwork itself can be read as an act of subversion. Similarly, some of my research interests involve challenging official or dominant narratives that have become associated with Coltrane, trying to seek out underlying agendas which might play a role in the changing representation and interpretations of his music, and offering an alternative means of understanding the Coltrane legacy. 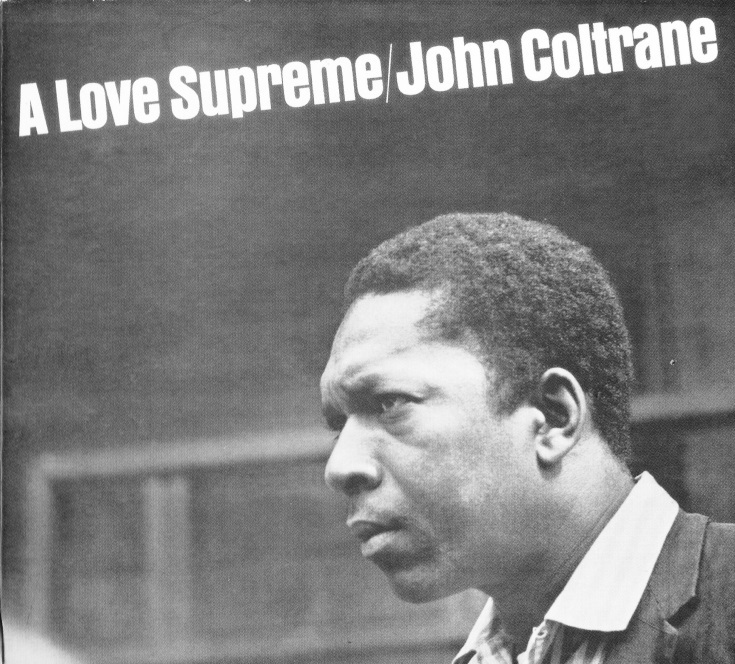 Album cover of John Coltrane’s A Love Supreme, 1964. Courtesy of the author. Coltrane’s seminal recording and MTO’s image exist among several other voices. A Love Supreme interweaves with, and stands out against, a crowded backdrop of other art (whether it is recorded sound or street art). The image encourages us to make links between the past and the present and also encourages us to think about the relationship between recordings and the materiality of everyday life. MTO painted a collection of other music-inspired street scenes in different settings, including portraits of Jimi Hendrix and Thelonious Monk. Yet the artists and his graffiti remain elusive. There are several untold stories such as how the work was created and who exactly MTO is beyond his pseudonym. (The artist has remained anonymous throughout our correspondence.) MTO is most often received as a mediated figure, but his presence speaks to many people in different communities in deeply personal ways. Finally, MTO’s image suggests a type of interdisciplinarity that is rooted in everyday life. It is not high art made for the gallery but a music-inspired creation that interacts with, and helps to shape, its environment. We are not instructed as to how to interpret this image, yet an awareness of Coltrane will play a part in our reading of it. This feeds directly into the way in which jazz is an interdisciplinary, cross-cultural, and transnational form. Arguably, images (whether they be on album covers or street walls), as well as written texts, poems, films, anecdotes, and broader cultural mythologies, have as much a role to play in the construction and framing of jazz as the sounds we hear on record. Throughout my study of Coltrane’s seminal album and a selection of his subsequent recordings, I wanted to convey a picture of the complexity of the Coltrane legacy and the politics of interpreting and understanding what Coltrane’s music means to people today. In many respects, I also wanted to highlight several paradoxes that are at play in the representation of Coltrane, between the increasingly controlled and restricted interpretations of Coltrane and his music on the one hand, and the widespread and multifaceted nature of Coltrane’s cultural influence on the other. MTO’s image served as a perfect visual manifestation of the issues and strategies at play. For me, MTO’s image, scenario, and the ideas that flow from it embody several of the key themes that run through my work. The saying goes that you should never judge a book by its cover. However, in the case of my Beyond A Love Supreme: John Coltrane and the Legacy of an Album, I would be happy for such a judgement to be made. Tony Whyton is Professor of Jazz and Musical Cultures at the University of Salford and the author of Beyond A Love Supreme: John Coltrane and the Legacy of an Album and Jazz Icons: Heroes, Myths, and the Jazz Tradition. He is the founding editor of the international journal The Source: Challenging Jazz Criticism and co-editor of the Jazz Research Journal. The Oxford African American Studies Center combines the authority of carefully edited reference works with sophisticated technology to create the most comprehensive collection of scholarship available online to focus on the lives and events which have shaped African American and African history and culture. Subscribe to only music articles on the OUPblog via email or RSS.